PEA (TBSL) strengthened their roster with addition of 27-year old American swingman Decorey Jones (201-90, college: Faulkner). 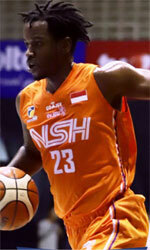 He played recently at CLS Knights in Indonesian IBL league. In two games he recorded 11.5ppg, 9.5rpg, 2.0apg, 3.5spg and 1.0bpg this season. Jones also played for Iwate Big Bulls (B League) in Japan that season where in 13 IBL games he averaged 5.9ppg, 2.5rpg and 1.8apg. Among other achievements he received Eurobasket.com All-Norwegian BLNO Honorable Mention award in 2016. Jones is a very experienced player. Thanks to his pro career he managed to play on five different continents (Europe, Asia, Latin America, Australia and of course North America) in nine different countries. Jones has played previously professionally in Argentina (Huracan), Australia (Mildura Heat, Noarlunga City Southern Tigers and Eastern Mavericks), Canada (Moncton Miracles), Chile (Espanol de Talca), Malaysia (Crouching Tigers), Spain (Innova Chef), WBA (Conyers CK), Mongolia (Aravtuud) and Norway (Nidaros Jets). He attended Faulkner University until 2012 and it is his sixth season in pro basketball. The scouts decsribe him following way: Decorey Jones is a Dynamic Swingman that can score in a variety of ways. Jones has the ability to put the ball on the floor and go coast to coast and is unstoppable in the open court transition game finishing strong at the basket. He is a great long-range shooter and can create his own shot. Very effective on pick and roll, can also take his man into the post and score over him. Good free throw shooter, Great rebounder. Extremely long arms allow him to grab steals and block shots to guard the 4-5 postition. He has a 6'8' wingspan.